Recommended to: Readers who are interested in reading about a family's struggle to cope after an unexpected event. Hannah was the kind of woman who turned heads. Tall and graceful, naturally pretty, often impulsive, always spirited, the upper-class girl who picked, of all men, Lovell--the introverted climate scientist, the practical one who thought he could change the world if he could just get everyone to listen to reason. After a magical honeymoon they settled in the suburbs to raise their two children. But over the years, Lovell and Hannah’s conversations have become charged with resentments and unspoken desires. She’s become withdrawn and directionless. His work affords him a convenient distraction. The children can sense the tension, which they’ve learned to mostly ignore. Until, after one explosive argument, Hannah vanishes. And Lovell, for the first time, is forced to examine the trajectory of his marriage through the lens of memory--and the eyes of his children. As he tries to piece together what happened to his wife--and to their lives together--readers follow Hannah through that single day when the smallest of decisions takes her to places she never intended to go. With the intensity of The Lovely Bones, the balance of wit and heartbreak of The Descendants, and the emotional acuity of Anne Tyler’s work, The Daylight Marriage is at its heart a novel about what happens when our intuitions override our logic, with a page-turning plot that doesn’t reveal its secrets until the very end. I must admit, this didn't feel very much like a "thriller" or mystery for me. Perhaps I'm just a good guesser, but there weren't any moments that surprised me or caught me off guard. The story evoked a lot of emotions, heartbreak and empathy for the characters being the top two. This is one of those stories that feels too real. A marriage in trouble, the heartbreak of a teenagers grief, realizing too late how important someone is to you....all of the feels. 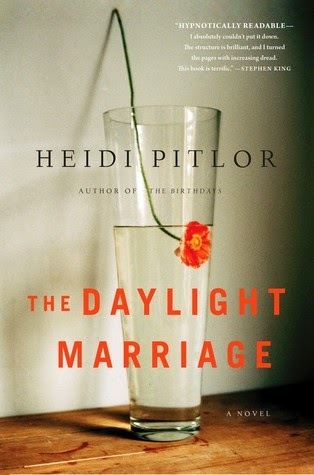 Heidi Pitlor writes a harrowing tale of a family dealing with a tragic circumstance. You get insight into life before the incident and the aftermath as alternate perspectives fill in the details of the life of this family. The characters are raw and flawed and while it was a very well written story, it is not what I would expect from a thriller. I finished this book feeling depressed, and with the reminder to appreciate the people in my life. To stop once in a while and check in with a parent, partner, child etc because you never know how quickly life can change. If you enjoy life-like stories about an ordinary family put in a tragic situation, then I recommend this.